There's a real issue facing our holiday tables, and it's time we all finally talked about it. It's causing epic battles between our loved ones and responsible for the National lowering in sales of marshmallows and food-like, marshmallow-like products. Yes, I'm talking about the Election. No, I'm not, Im talking about the fact that nobody is eating marshmallows anymore and people can't figure out how to make a sweet potato casserole with half marshmallows and half pecans and brown sugar. It's the impossible dream! I originally assumed the war on obesity might be the reason people are abstaining from the good fluff, but that's not the case. No, apparently the big issue is peanut allergies — so many kids can't eat peanut butter (or if they can, they can't eat it at many schools because of bans) that the staple (?) of Fluffernutter sandwiches is no more. Gone are the days when you can smear sweet chemicals and death-nuts on two nutritionally-void slices of edible Carmex and send your kid off for a fun day of sugar-high and the shits. Now everything has to be all "real food" and "not garbage poison." 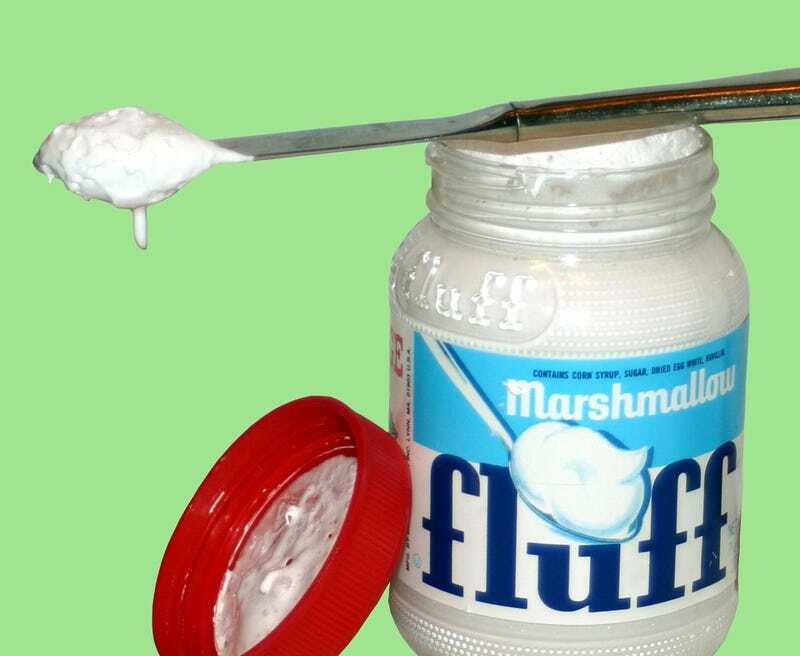 Because of this, the holidays are now the biggest time of year for companies like Kraft, who say 35% of the annual consumption of its Jet-Puffed marshmallows and marshmallow cream happens in the fourth quarter. But still, what happens when your sister wants the white peaks atop her sweet potato casserole and your brother won't settle for anything but pecans and brown sugar. WHAT TO DO?? The issue is enough to divide families. "It's been going on since I was growing up; we really, really love our sweet-potato casserole but we can never agree on a topping," says Joshua Grotheer, the spokesman for Georgia State University's school of hospitality. "I'm wanting the golden crispiness of nuts on top, but my brother and my dad's side of the family want the marshmallow on top." Well, uh, half and half should be just fine then, right? Problem solved? Hugs all around? Really, I'm not sure why this article exists and why I'm writing about it, other than I like to eat Ricemellow cream directly out of the carton and have always wanted to do a whipped cream bikini on my boyfriend with it. Whipped Marshmallow Mankini: The Laura Beck Story. Happy Holidays!